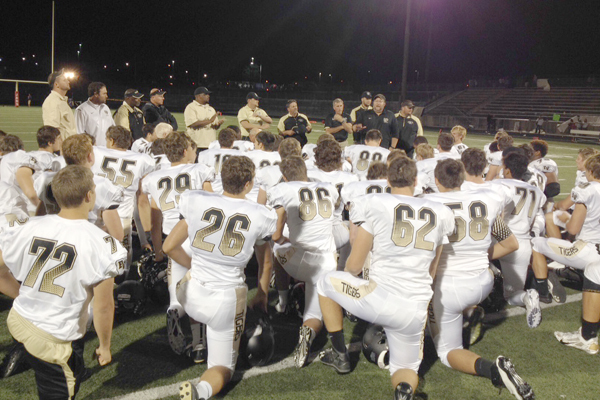 Blue Valley senior Colton McCumber is the lifeblood of the Tigers football program. After a week one victory over Shawnee Mission Northwest, the veteran quarterback was leading the 6A class in rushing yards with 238 and had Blue Valley looking like a legitimate threat for another state title. So when McCumber left the game after the opening drive against Blue Valley West on Friday night at the Blue Valley District Activities Complex, few in the stands had high hopes for what would come next: A 34-24 takedown of one of the top teams in the 5A class, led by... Matthew Dercher. Standing a meager 5-foot-11, 158-pounds, the junior backup was abruptly put under center after McCumber could not return following a rare mistake on the game’s opening snap. Chasing a rolling pigskin out of the end zone, Blue Valley’s star tumbled hard on the back end line, toppled by a pair of Jaguars, and jogged gingerly to the sideline rotating his non-throwing arm. Nevertheless, smelling blood, the home squad from West then utilized a 10-play scoring drive that spanned over five minutes, as senior quarterback Nathan Wiles, with a defender wrapped around his ankles, managed to stay upright long enough to connect with Cole Richenburg inside the pylon to extend the Jaguars lead to 9-0. Clearly nervous on his initial snaps, Driskell remained patient with Dercher’s ability to orchestrate a comeback. After a third drive stalled with a punt, the junior eventually found his comfort zone in the pocket early in the second quarter. With help from classmate Gus Gomez through the air, the Tigers drove through the West defense ending with a Dercher read-option cutback scamper from 18 yards out. The rest was history. From there, the physical defense patented by Tigers defensive coordinator Rick McNerlin kicked into old form, as Blue Valley held the duo of Wiles and running back John Lacy in check as Blue Valley West was held scoreless until late in the third quarter. The real story here though remains the play under center from Dercher. Seeing just his second varsity action in a Blue Valley uniform, the backup was able to stretch Wright’s defense vertically when it counted most. Once Dercher was able to prove his worth through the air, the 6A power was able to fall back into their true comfort zone, stuffing the ball into the chests of thunder and lightning rushers AJ Totta and William Evans. Totta, a throwback to the leather helmet days of bruising ground gains, busted his 216-pound frame into the heart of the Jaguar defense and, in the case something with more flash was required, the wheels of Evans were able to find the sideline and burst up field for valuable yards. Looking ahead in the Eastern Kansas League, the Jaguars may finally get a chance to breathe after a rough opening slate to 2015. Following losses to two undefeated 6A powers in Blue Valley and Lawrence, Blue Valley West has the fortune of entertaining Blue Valley North and Gardner Edgerton the next two weeks. Meanwhile, for the 2-0 Tigers, next week’s contest with a fellow undefeated, Bishop Miege, figures to be one of the metro’s most heated affairs with the likelihood of a league title at stake. The only question now is which quarterback Blue Valley will throw into the fire against the Stags. Luckily for the Tigers, they now have two worthy options.